ST. GEORGE – Shortly after New Year’s Day, blue cans started to appear at homes across the county in preparation of the BluCan curbside recycling program slated to begin the week of Jan. 31. St. George, along with LaVerkin, Leeds, Hurricane, Ivins, Rockville, Santa Clara, Springdale, Toquerville and Washington City, have each signed on to the BluCan Recycling program last year as a means to prolong the life of the county’s landfill. Prior to adoption and implementation of the program, St. George and several other cities gave residents the opportunity to opt-out of the program last fall. The opt-out period ran through September and October, with cities involved sending notices out with utility bills and others means in order to inform the public. Residents who didn’t choose to opt-out were automatically added to the program. Springdale, Hurricane and Ivins made participation mandatory. The Washington County Solid Waste District reported in November that 85 percent of St. George’s population was signed into the program. Participation in other cities that allowed an opt-out option ranged from 49 percent to 78 percent. A total of 87 percent of county residents enrolled in the recycling program, according to the solid waste district. Overall, 41,944 homes across the county have already received, or will yet receive, the BluCan. “Basically all of the cans are being delivered now,” Pike said, adding that pick up will begin the weeks of Jan. 31 and Feb. 7. Pick up of recyclables will be the same day as garbage pick up, though every other week, Pike said. Smaller cities will start recycling service on the week of Jan. 31. Due to their size, parts of St. George, Hurricane and Washington City will start service the week of Feb. 7. Service in Ivins will also start that week. 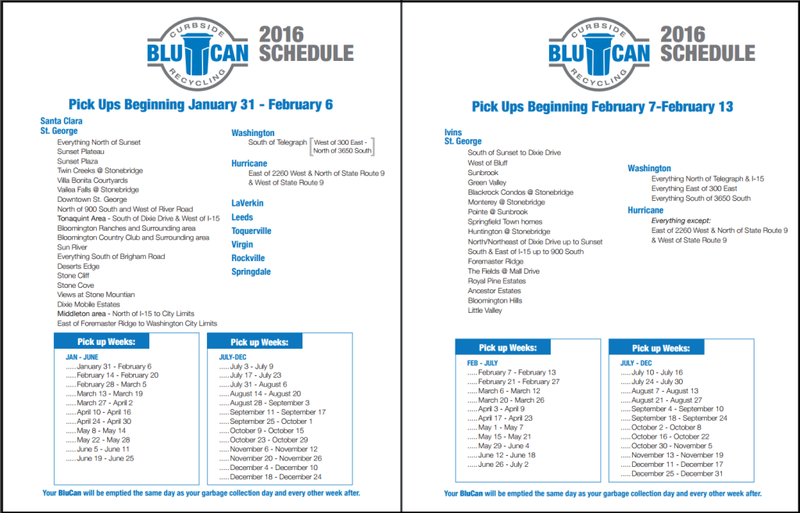 The 2016 schedule is provided below, courtesy of BluCan.org. Click the image to enlarge. Due to the large percentage of participation, the monthly charge for the recycling program in St. George will be $3.12, Pike said. It is down from the original $4 that was anticipated in case participation number were lower. BluCan allows residents to deposit paper, plastic, cardboard and metal waste into their own BluCan, a can that will be similar to their current garbage can. Glass is currently excluded from the list of acceptable recyclables. My wife and I were very excited to receive our blue can and we have already placed some cardboard in it. I got my blue can about 2 weeks ago and it’s already filled up with beer bottles. Now I find out that they don’t want bottles. Oh Jeeze, guess I’ll start hucking em over the fence like I used to. I’m excited too. I’ve already started to load mine up. Put 2 old car batteries in it, along with a jug of oil and a filter from a recent change, and an old computer. This is going to be great ! I’m all for the environment and recycling and will gladly participate in the Blue Can. My problem is why are we paying extra to recycle when someone is making big money off our efforts. Recycling and waste management is a multi-billion dollar business and we’re paying $3 a month to cover their overhead. That is a rip off. Oh, you guys! Such party poopers. I am happy to recycle and have found it easy to get the right things in the recycle can. Of course, I am still recycling my own aluminum. They can have my cardboard and paper junk. I am very happy about the recycling program and I look forward to participating, but I know a lady in her nineties that cannot see. All her bills are automatically taken out at the bank. She just shreds her mail. She did not know about this nor realize that she had to “opt out”. The blue can on her curb came as a surprise to her. When I visited today, we talked about it and she said she’ll have her seventy-three-year-old daughter cancel the service. I wonder how many other disabled seniors are confused by all this?